Today I got to visit the Nuffield Department of Primary Care Health Sciences at Oxford University. It was a great to be invited along to give a seminar on measuring outcomes in preventative services. Thanks to all of the people that came along and the useful discussion that the seminar provoked. Our system of outcome measurement is organic and needs to input from the people that do face to face work to help us shape how it develops. For anyone interested, or even if you came along, the slides are embedded below. 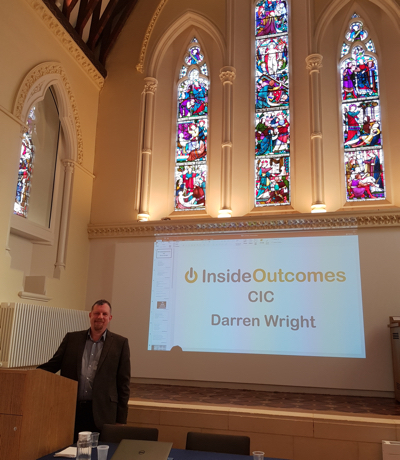 The seminar covered some of the reasons why Inside Outcomes exists, covering the need to challenge whether services are truly commissioned or whether they are procured. How you look at the types of data that you collect and why you collect them. Then, from our point of view, the most important part; how you can easily measure a range of outcomes from interventions that relate to national policy. We also looked at the benefits of whole person assessment and how open data can provide live data to inform commissioning decisions. This was an interesting opportunity that sprang out of a conversation on Twitter some months ago where I’d mentioned some of the challenges we had experienced in getting commissioners of Diabetes projects to take into account wider social outcomes. The agencies we work with, who provide diabetes services, demonstrate excellent outcomes but there seems to be a lack of interest, from commissioners, beyond the narrow clinical outcomes. This seminar gave us an excellent opportunity to propose that there is a different way of commissioning services and it is entirely in line with the Government’s National Outcome Frameworks. You can see the slides below.